The bottom book I have had for some time now and been wanting to read it and now is the time. 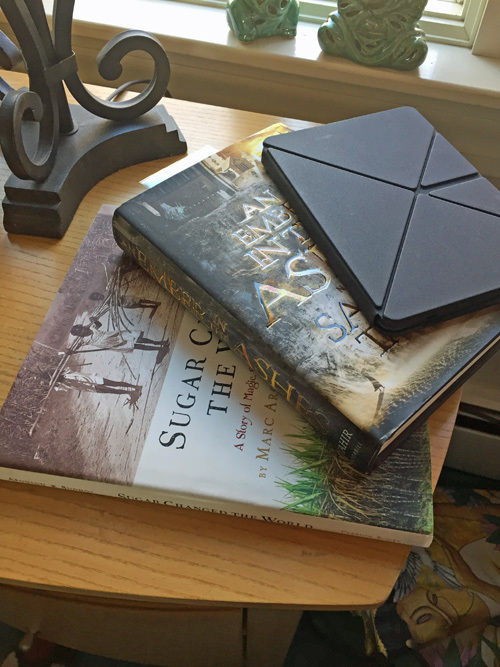 It is titled, “Sugar Changed the World: A Story of Magic, Spice, Slavery, Freedom and Science by Marc Aronson and Marina Budhos. The photography is amazing in this book. I will definitely post a review when I complete it. The second book is my book club selection for February, and it is titled, “An Ember in The Ashes” by Sabaa Tahir. This book came out last year with a lot of fanfare at the bookstores. I have already started it and it is really good so far. The top book is my Kindle which has the book titled, “Number the Stars” by Lois Lowry and I have chosen to read along with Nicholas since this is an assigned book from school. Some people ask me how I read more than one book. My answer is simple, “The same way I watch more than one television show.” I typically read one book and listen to audiobooks at work. But last month I read multiple books and had no problem. I guess it depends on my mood and the type of reads. Reference, self-help, non-fiction mix better with fiction books. They are easily not confused. I don’t typically read the same genres at the same time because it might lead to confusions early on in the reading process. I hope that helps answer the question. I hope you have something good to read on your nightstand. If not, what are you waiting for?